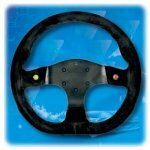 Flat bottom 310mm, multi purpose buttons for horn, communication systems etc. 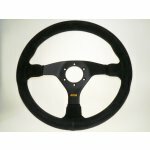 Excellent 330mm flat bottom steering wheel. 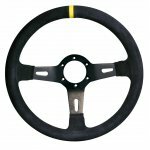 Black Suede 350mm steering wheel with yellow center stripe. Flat wheel for standard fitment. 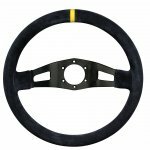 Black Suede 330mm Rally steering wheel with yellow center stripe. 65mm dished wheel for extended fitment. 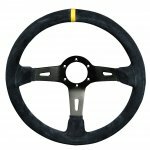 Black Suede 350mm Rally steering wheel with yellow center stripe. 65mm dished wheel for extended fitment. 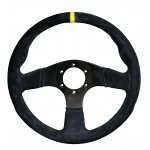 Black Suede 350mm Rally steering wheel with yellow center stripe. 90mm dished wheel for extended fitment. Black Suede 330mm steering wheel with yellow center stripe. Flat wheel for standard fitment. 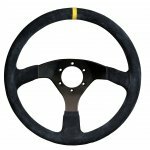 Black Suede 350mm Rally steering wheel with yellow center stripe. Flat wheel for standard fitment. 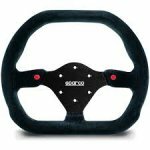 Excellent 330mm steering wheel featuring flat bottom and 2 x push buttons. 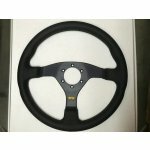 This wheel is a fantastic addition to your race car. It features a classic style and smooth & simple design with a suede finish. 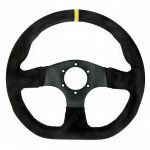 This wheel is a fantastic addition to your race car. It features a classic style and smooth & simple design with a leather finish.